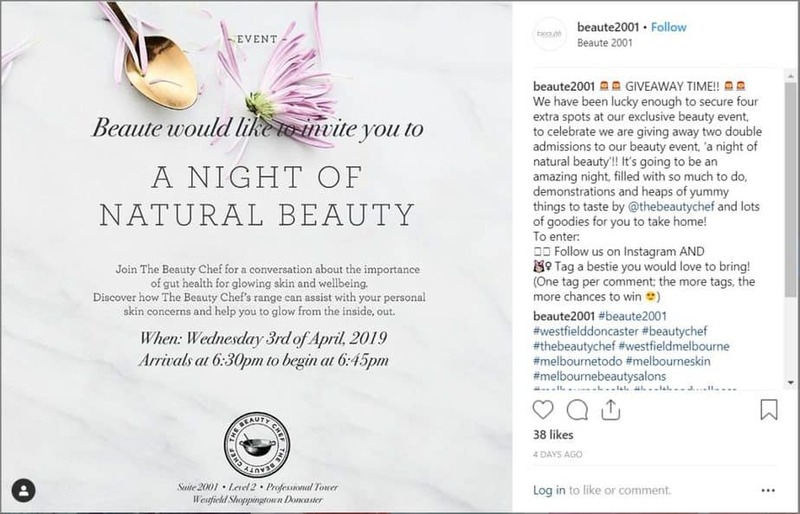 Instagram has become the go-to platform for brand marketing. With over 500 million daily active users, this comes as no surprise. Businesses use this platform for a number of online marketing strategies. One of which is launching an Instagram contest. But before you launch your first contest, there are a few things to consider. Firstly, we’ve come up with useful tips. Secondly, we also curated fun and creative contest ideas. Most importantly, we also made a comprehensive list of Instagram contest rules. 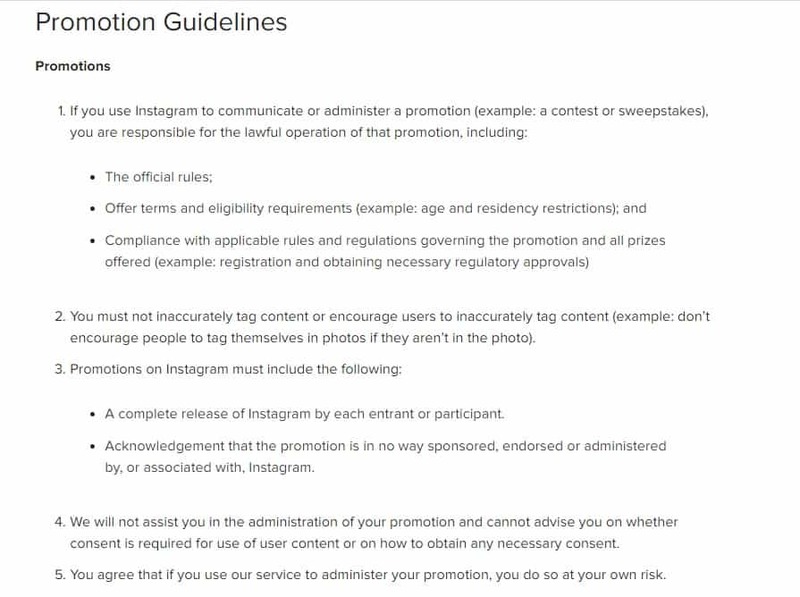 Before anything else, you need to know Instagram’s rules. Take time to read the guideline below. Don’t let your contest be taken down for violating Instagram’s policies. Your Instagram contest must have clear rules, terms, and eligibility requirements. Place a disclaimer. State that the contest is not sponsored by or associated with Instagram. It’s not common for Instagram contests to be flagged for minor issues. However, it’s still better to follow the guidelines. Obviously, you don’t want to break any law – even unintentionally. Contest laws and regulations may vary depending on an area. This becomes even more complicated when your contest is open internationally. With that said, consider hiring a lawyer. They’ll help you write your Instagram contest rules. Additionally, when partnering with an influencer, follow the disclosure rules. When running a contest, make sure to put a disclaimer. 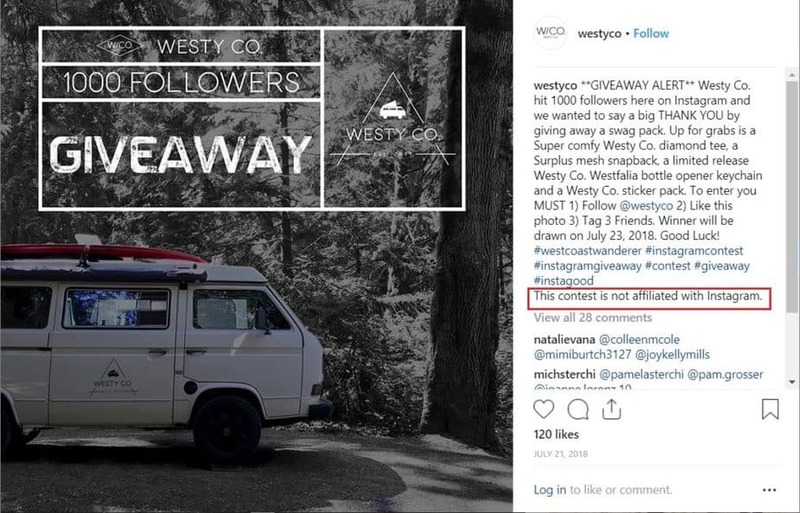 Take a look at this Instagram contest from Westyco. They’re a company that sells outdoor apparel. To celebrate hitting the 1K follower milestone, they decided to do a giveaway. The mechanics should be easy to find. Tell the audience what they need to do to enter. This also includes who can enter. If your contest is limited to users within a certain area, add that information in the post. In doing so, only those qualified can enter. Take a look at this post from Glow Recipe. After listing the contest mechanics, they added a line that says it is open globally. This means anyone can join! You can ask participants to tag themselves or a friend in the comment section. Don’t ask them to tag their friend on a photo. For example, one of your mechanics is to post a photo or video. Encourage participants to use your branded hashtag instead. You don’t decide to run an Instagram contest on a whim. Carefully plan it out. Determine why you want to host a contest. With that said, you must set goals and objectives. These must align with your brand’s identity and target audience. Once that’s done, plan a contest with those goals in mind. Take this example from Renee, a skincare influencer. She partnered with SkinCeuticals for a giveaway. In doing so, it increased brand awareness as well as promote their latest product. Entice the audience to enter your contest! Make your rules simple and straightforward. With this in mind, avoid listing confusing contest mechanics. State clearly in the caption what it takes for the audience to enter. Ask your audience to post a photo or video on the platform. It’s useful to create a branded hashtag for easy tracking. Have your audience like, follow, and tag other users. Another option is to ask the audience to tag your brand in one of their posts. As long as your entry methods are clear, you’ll spend less time answering questions. More importantly, you’ll be complying with Instagram’s policy. 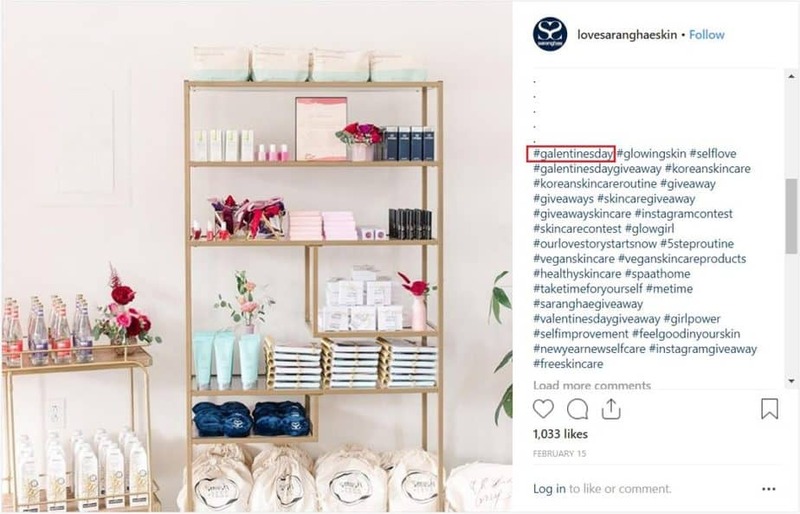 When running an Instagram contest, a branded hashtag is essential. Firstly, it creates a connection between the contest and the content. Secondly, it drives interest and engagement. Most importantly, it helps you track entries. Tip: Use branded hashtags together with generic hashtags. The latter will help your contest show up when users search them. Make sure that users can easily recall it. Although a unique hashtag catches attention, it should also be easily identifiable. In doing so, you’ll also increase brand recall. The hashtag should relate to your brand name, product, or service. Avoid using generic hashtags like #giveaways or #flashbackfriday. This will make it hard for you to track entries. As a tip, search the hashtags you’ve come up with. Has it ever been used? If so, you’ll need to brainstorm some more. 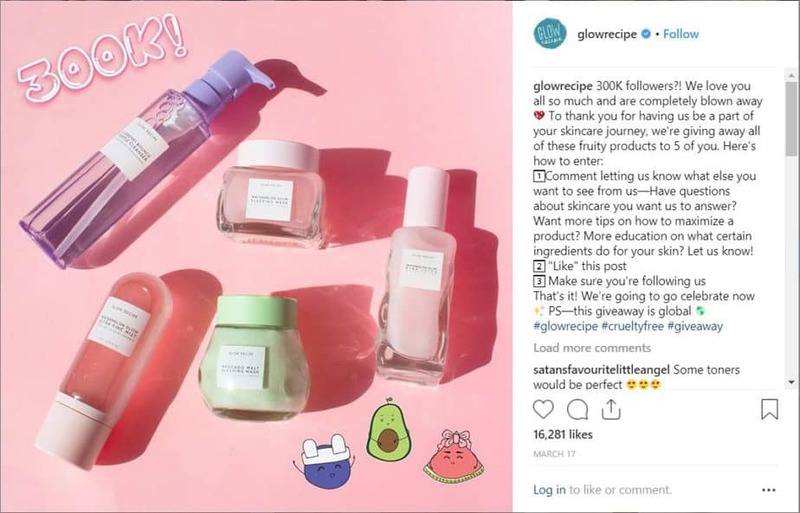 Here’s an example from Glow Recipe, a skincare brand. They asked their audience to post a picture on Instagram and use the #maskeverywhere tag. It’s short, relevant, and unique. To get the contest going, you need a call-to-action. This means asking the audience to do something. For example, ask them to follow your account, tag a friend, or reply to your post. Your call-to-action should be short and clear. Remember, the fewer mechanics, the better your contest will be received. However, make sure to get the audience to take action. A highly-coveted prize will encourage the audience to participate. However, picking a brand-related prize will help you reach goals. For instance, giving away generic prizes will earn more entries. But these entries are lower in quality. Plus, it won’t attract your target audience. So what’s a good prize? It should be something your target market needs or wants. Take this example from Farmacy, a cruelty-free skincare brand. 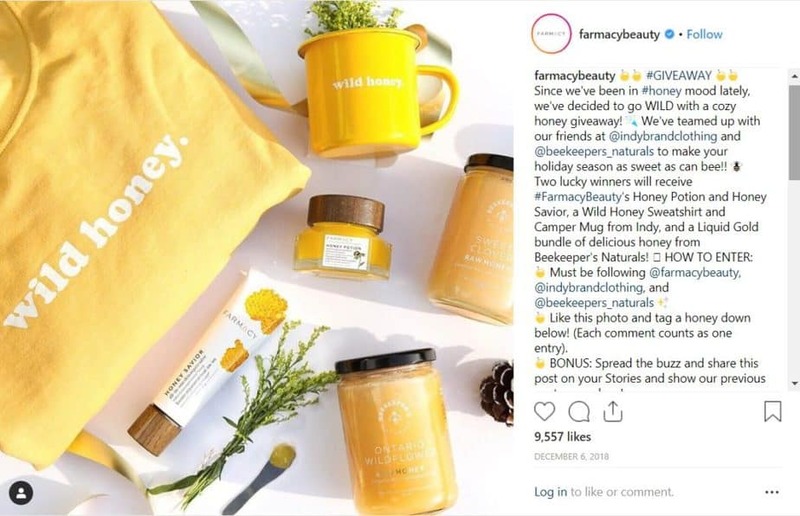 The lucky winners of their contest will win their Honey skincare products. Another Instagram contest idea for prizes is gift cards. This will increase brand awareness and will allow users to try your products. Don’t make your participants wait too long. If one of your goals is to increase brand awareness, then a short contest is perfect in creating a buzz. So, how long should an Instagram contest last? Ideally, contests last for a week. This leaves enough time for the giveaway to gain traction. Plus, it also creates just enough urgency. 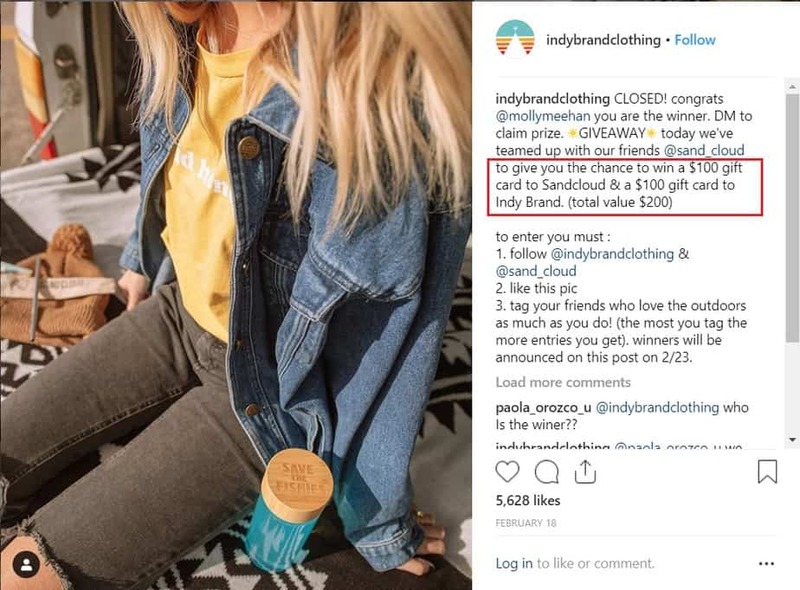 Some brands run an Instagram contest that lasts 3-5 days. 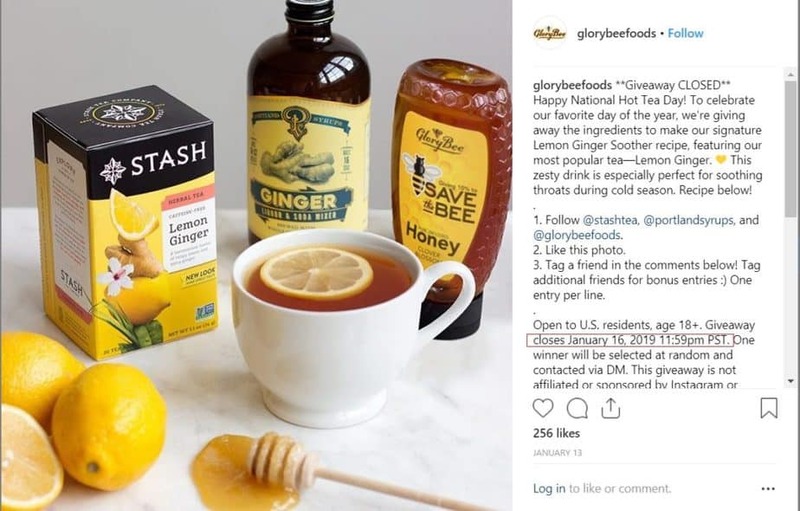 Take this example from GloryBee, a honey and natural ingredient company. The content below was posted on Jan 13, 2019. On January 16, 2019, they announced the winner. Tip: When running a contest, make sure the start and end dates are clearly stated. Promote Like Your Success Depends On It! Remember, not everyone’s going to find your latest contest. So, promote the heck out of it! Give your audience a heads up: Excite your audience. Let them know that an Instagram contest is about to happen. This will build anticipation and create buzz. Use your bio: Make it easy for users to know about the contest. Add short info as well as the contest link to your bio. Take advantage of Stories: Use this feature before, during, and after the contest period. Keep your audience aware and interested. DM is the key: Let your VIPs know about the giveaway. In doing so, they will feel valued, improving brand loyalty. Most importantly, share your Instagram contest to other social media platforms. 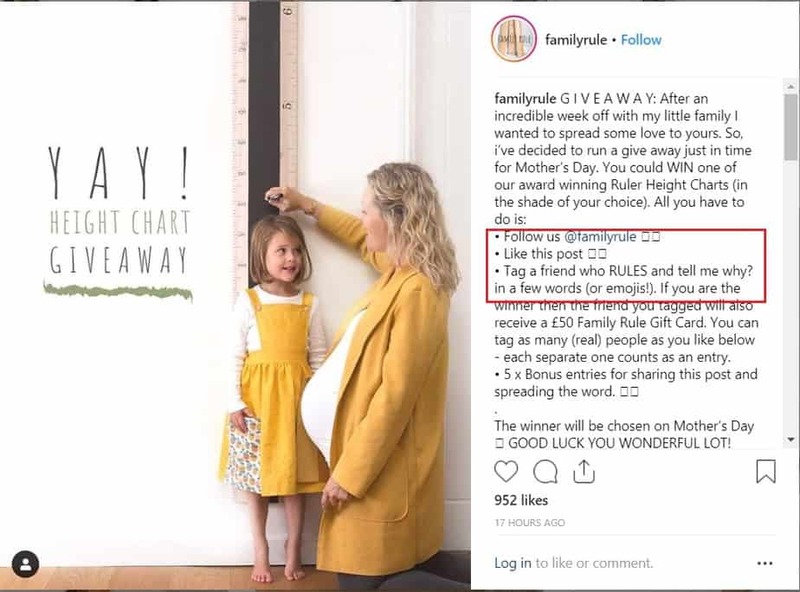 How To Choose An Instagram Contest Winner? Have a game plan for choosing a winner. In doing so, you can create clear Instagram contest rules. Choosing the winner by the number of votes is one of the best options. Why? First of all, it boosts brand awareness. Participants will share their entry and the contest. Second, your Instagram contest will gain traction. It’ll spread organically when participants start sharing. Lastly, it promotes engagement. Tip: Consider using third-party software to verify voters and set restrictions. Higher quality of entries. You can use the entries for user-generated content in the future. You can choose an entry that best represents your brand. This provides you with better control throughout the contest process. This selection method increases the number of participants. With that said, it’s the perfect method if your goal is to have massive engagement. Collect all entries then use a random generator to pick a winner. However, this method produces lower quality entries. In addition, it also attracts users who are only in it for the freebies. Tip: If choosing a winner randomly, contact the winner privately. This way, you can verify their eligibility. Announce the winner as soon as the contest period is done. Failing to do so will reflect badly on your brand. 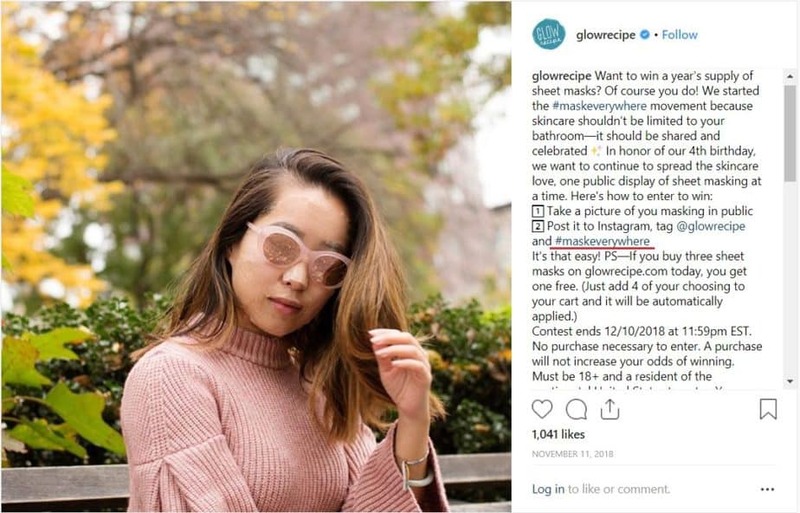 Your audience will think that the Instagram contest was a scam. So, don’t forget this last step! Need to get your creative juice flowing? This is the most popular contest method. It’s easy and straightforward. All you’re asking is for participants to tag a friend in the comment section. This method is great for improving your brand’s reach. Why? The tagged users will then know about the contest and your brand. Additionally, it also increases the engagement rate. One of the best Instagram contest ideas is to nominate a friend to win. How does it work? Ask participants to tag a friend who they think deserves to win the contest. This means the one nominated will an entry. 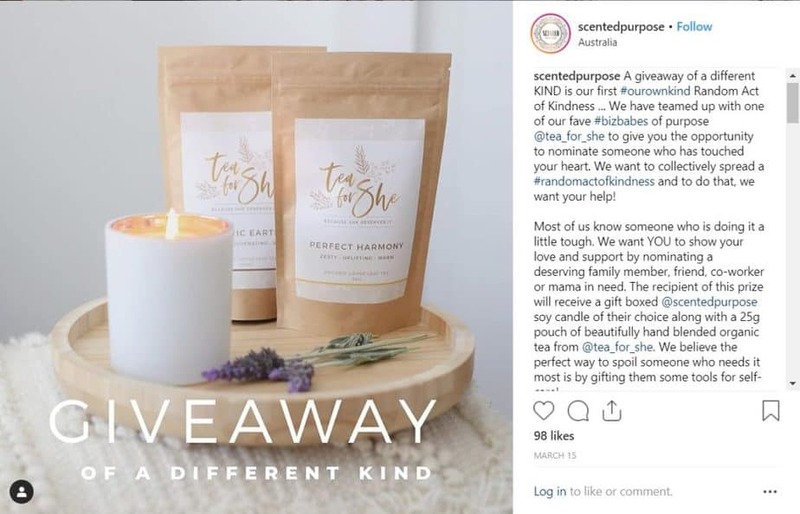 Take a look at this Instagram contest by Scented Purpose. They wanted to spread #randomactofkindness. That’s why they asked their audience to nominate deserving individuals. Don’t just ask users to follow and tag a friend. Make deeper connections! Asking participants to follow your account then share a story is a fun and unique contest idea. Of course, the story should be relevant to your brand. When done right, this can lead to higher engagements. A better alternative is to ask participants to post content and share a story. They can use your branded hashtag to create buzz. Take this example from Dunkin Donuts. They asked participants to share how Dunkin Donuts played a part in their love story. Isn’t that sweet? • Encouraged fans to post content. Take advantage of this visual platform. 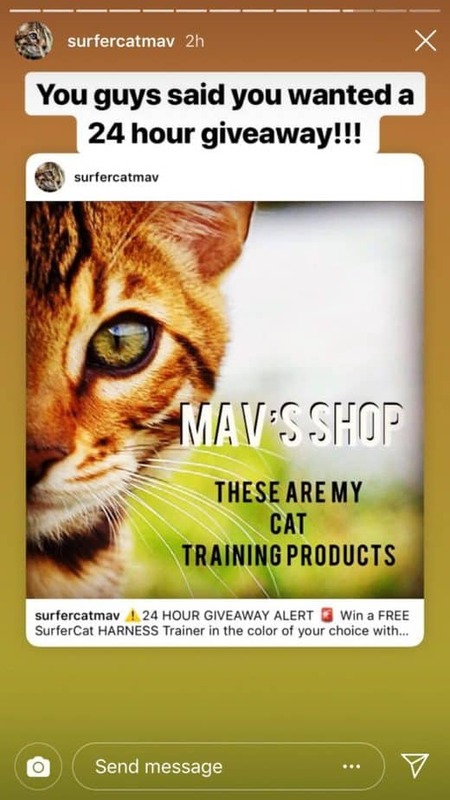 This type of Instagram contest is great for a lot of products. For one, it boosts brand awareness. More importantly, you can use the content generated for your future posts. 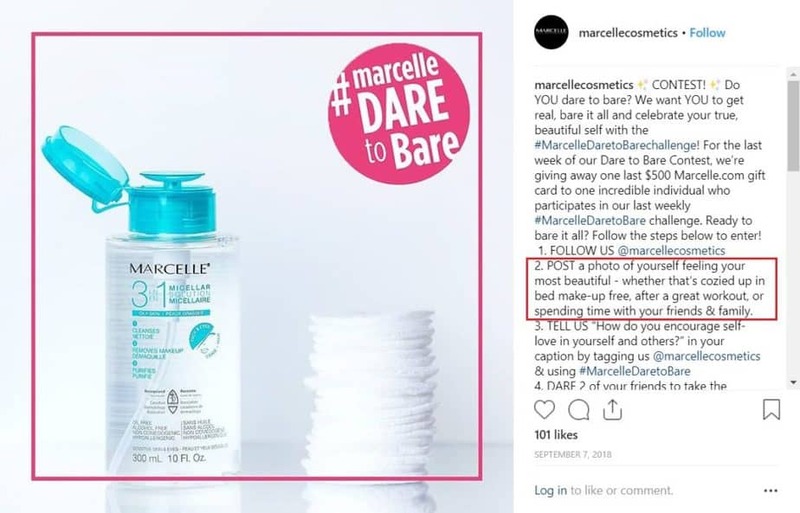 Take this post from Marcelle as an example. They are a Canadian cosmetics brand. One of their products is a Micellar Water which removes oil and makeup. It leaves the skin bare. With that, they created an Instagram contest where they dared their fans to go bare. It’s one of the best Instagram contest ideas. It’s unique, fun, and exciting. So, how do you pull this off? Take a few notes from Modcloth. They are a fashion brand with 633K followers on Instagram. 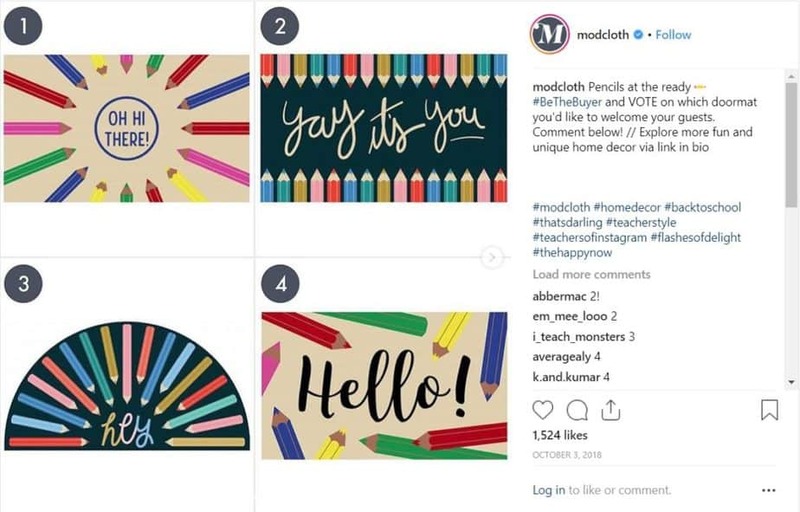 They asked their followers to vote on new product designs in the comment section. After that, they ran a giveaway on the post. 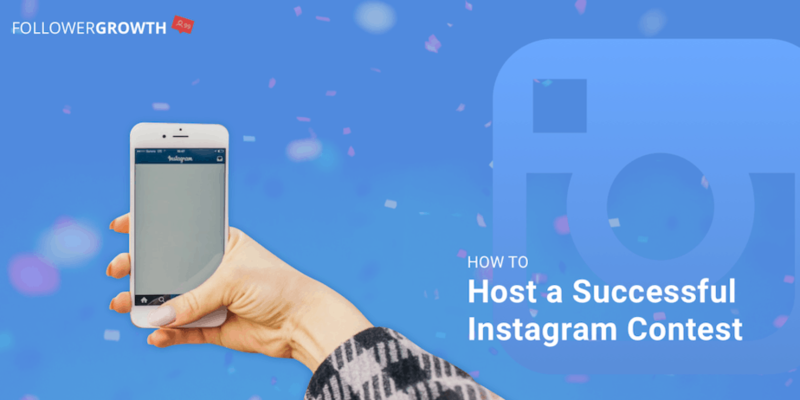 Ready to Host An Instagram Contest? 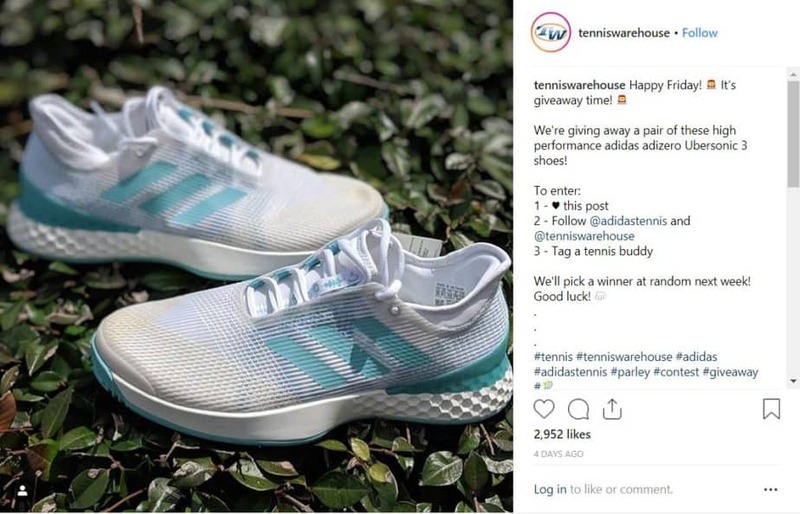 Now you know the basics of running an engaging Instagram contest. Go and put your knowledge to work! 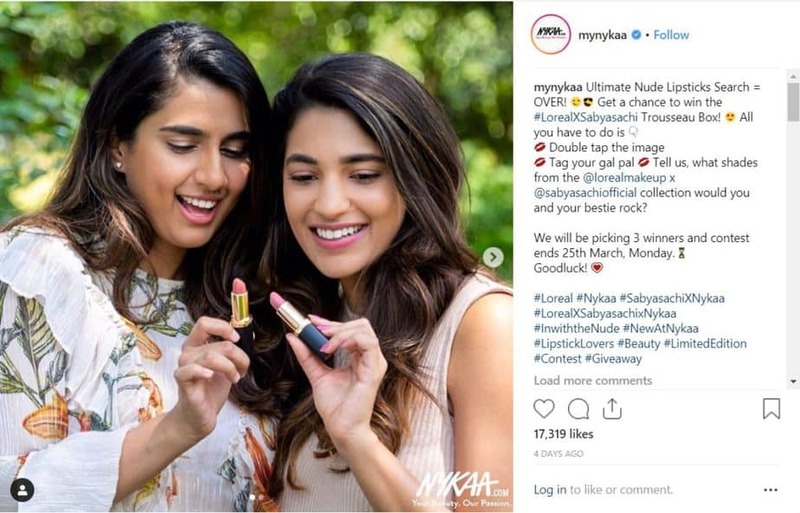 Instagram contests are not only fun but they also help you reach a wider audience. Additionally, it’s also a way to give back to your followers.